Robinson Springs United Methodist Church (founded in 1828) is one of the oldest churches in Elmore County. The present sanctuary was completed in 1845. Robinson Springs UMC is a Greek-colonial architectural structure. The church building is large for rural churches of the time and it’s believed that the builders used the measurements for the Tabernacle that God gave Moses during the wanderings in the wilderness. 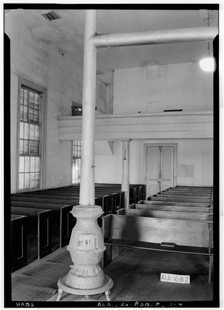 Included in the sanctuary is a slave gallery that was still in use by African American members after the Civil War. There is no interior access to the balcony as slaves were not allowed to enter the actual sanctuary. Visit the Robinson Springs United Methodist Church website, www.rsum.org, to learn more about their rich history, see their worship service schedule, and perhaps plan to visit this beautiful historic church in our Alabama-West Florida Conference.